In a nationally televised statement, Prime Minister Naoto Kan said radiation has spread from the four stricken reactors of the Fukushima Dai-ichi nuclear plant along Japan's northeastern coast. The region was shattered by Friday's 9.0-magnitude earthquake and the ensuing tsunami that is believed to have killed more than 10,000 people, plunged millions into misery and pummeled the world's third-largest economy. Japanese officials told the International Atomic Energy Agency that the reactor fire was in a storage pond and that "radioactivity is being released directly into the atmosphere." Long after the fire was extinguished, a Japanese official said the pool, where used nuclear fuel is kept cool, might be boiling. "We cannot deny the possibility of water boiling" in the pool, said Hidehiko Nishiyama, an official with the economy ministry, which oversees nuclear safety. Though Kan and other officials urged calm, Tuesday's developments fueled a growing panic in Japan and around the world amid widespread uncertainty over what would happen next. In the worst case scenario, one or more of the reactor cores would completely melt down, a disaster that could spew large amounts of radioactivity into the atmosphere. "I worry a lot about fallout," said Yuta Tadano, a 20-year-old pump technician at the Fukushima plant, who said he was in the complex when quake hit. "If we could see it we could escape, but we can't," he said, cradling his 4-month-old baby, Shoma, at an evacuation center. Tokyo reported slightly elevated radiation levels, but officials said the increase was too small to threaten the 39 million people in and around the capital, about 170 miles (270 kilometers) away. Closer to the stricken nuclear complex, the streets in the coastal city of Soma were empty as the few residents who remained there heeded the government's warning to stay indoors. Kan and other officials warned there is danger of more leaks and told people living within 19 miles (30 kilometers) of the Fukushima Dai-ichi complex to stay indoors to avoid exposure that could make people sick. Weather forecasts for Fukushima were for snow and wind from the northeast Tuesday evening, blowing southwest toward Tokyo, then shifting and blowing east out to sea. That's important because it shows which direction a possible nuclear cloud might blow. 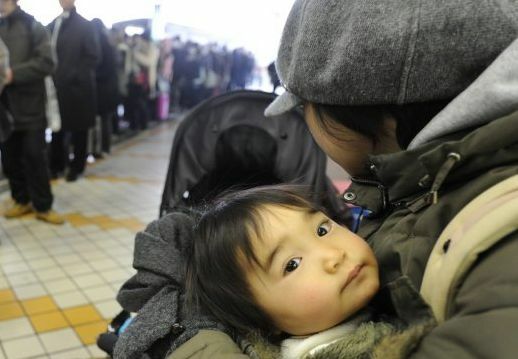 Some 70,000 people had already been evacuated from a 12-mile (20-kilometer) radius from the Dai-ichi complex. About 140,000 remain in the new warning zone. On Three Mile Island, the radiation leak was held inside the containment shell -- thick concrete armor around the reactor. The Chernobyl reactor had no shell and was also operational when the disaster struck. The Japanese reactors automatically shut down when the quake hit and are encased in containment shells. Olander said encasing the reactors in a concrete sarcophagus -- the last-ditch effort done in Chernobyl -- is far too premature. Operators need to wait until they cool more, or risk making the situation even worse. Though Japanese officials have refused to speculate on the overall death toll, Indonesian geologist Hery Harjono, who dealt with the 2004 Asian tsunami, said it would be "a miracle really if it turns out to be less than 10,000" dead. The 2004 tsunami killed 230,000 people -- of which only 184,000 bodies were found. Rescuers were heartened Tuesday to find one survivor. The 70-year-old woman was found inside her house, which had been washed away by the tsunami, said Osaka fire department spokesman Yuko Kotani, whose teams had raced to the region to help with disaster relief. It wasn't clear if the house was still at sea, or if it had returned to the shoreline, when she was found. The woman was conscious but suffering from hypothermia and is being treated at a hospital, Kotani said.